The True Cost looks at the negative effects of the fast fashion industry pertaining to human rights, agriculture, and business. The clothing donated, after being donated and re-purposed, will be shown in the fashion show to highlight the power or reusing. Join the Marion Cinema House and Marion Design Co. for Marion Made, a fashion show inspired by the screening on Friday June 29th, 2018 at 8pm. Want to see your outfit on the runway? 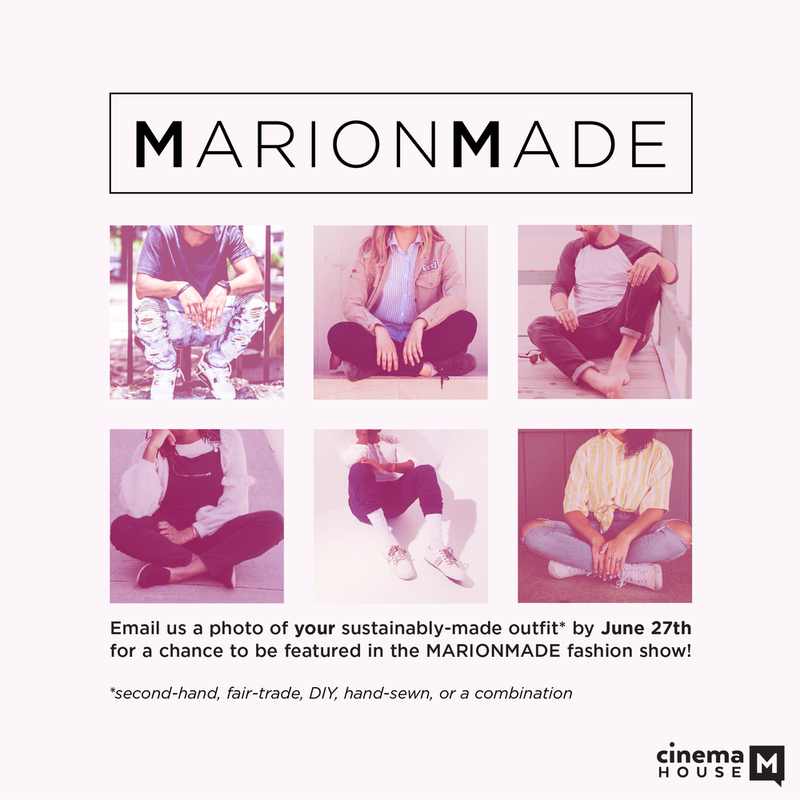 Email mariondesignco@gmail.com a photo of your sustainably-made outfit along with this short form to be featured in the Marion Made fashion show! Screening for the film was on June 8th, 2018 at 6:15pm and featured free admission and food. After the documentary, a short discussion was taken place over the content. Donations will be accepted at Marion Design Co. From up until June 27th. There are no restrictions as to what should be brought in and all donations are welcomed. Please refer to our open hours (Tuesday-Friday, 9am-4pm) to drop off any clothing donations. All donations will be reused and re-purposed by high school students and later featured in “Marion Made”, a community fashion show that will be held at the end of the month. The clothing, after being donated and re-purposed, will be featured in "Marion Made" on June 29th, 8pm as a means to highlight the power of reusing. We believe that when you consider creative clothing solutions that are sustainable, environmentally-friendly, and fair-trade, you empower people far beyond your reach. THANK YOU TO COMMUNITY FOUNDATION OF GRANT COUNTY, TIM AND MARY ECKERLE, CHANTAL DOMINIQUE PHOTOGRAPHY, WILDCAT ACADEMY, TRACE FASHIONS, AND THE QUILTER'S HALL OF FAME!